The first page of my Employment Book. 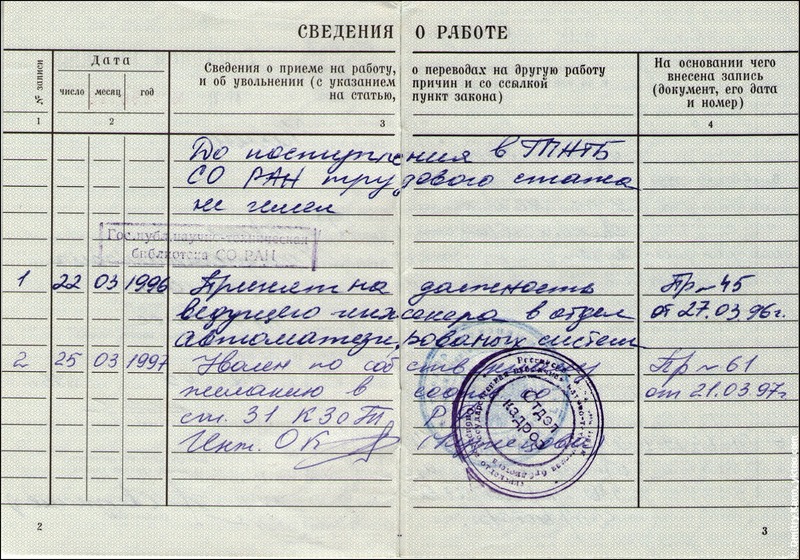 It reads: "March 22, 1996: Hired as a principal engineer of IT department at the Siberian Branch of the National Public Library for Science and Technology". One might wonder how a student with no professional experience could have been hired as a principal enginer. The thing is, at those chaotic times a construction worker might be paid a higher salary than a university professor. In order to motivate me my future boss had offered me the highest available position at the department. And I was indeed motivated. Nonetheless, one year later (the record No. 2 on the scan above), after my graduation, I had to quit to return to my home city Tyumen.